A good excuse to see a new city, or even a new country, is an event. Be it a concert, visiting a friend or family member, a special occasion, festival or convention. For our trip to Austin, Texas it was the latter. Rooster Teeth (an internet based company that makes podcasts, videos, movies and more) has been holding RTX in their home-town of Austin since 2011. It is a convention/expo which consists of panels, live shows, premiers, stalls and more. They have since expanded to Sydney and London. This wasn't our first RTX, we actually went over to Sydney a couple of years ago for the very first RTX Sydney. So this year, while on the great big continent of North America, we wanted to take the chance to go to the original RTX in Austin. We also figured it would be a good excuse to visit a new city. Video games and nerdy pop culture aren't necessarily the first things that come to mind when you think of Texas, but they definitely have a presence and even add to the dynamic and unique feel of the city of Austin. The city is laid-back, while also proud, and seems to embrace different cultures existing within it, including video game ‘nerds’, anime fans, ‘geeks’ and more. There were still many of the elements you would expect when visiting the Southern state; country music played in restaurants and shops, hearing “y’all” actually being used, BBQ joints with their glossy array of meat served by weight, and Tex-Mex specialties like breakfast tacos. However, there was also plenty that you wouldn’t necessarily expect from Texas. As we walked around the downtown area, we saw electric scooters available to rent, art-house cinemas outnumbered mainstream multiplexes, and rather than seeing an endless row of all the usual shops and fast food restaurants, there was a vibrant and unique array of independent restaurants, bars, shops and businesses. Most of our time was taken up by the Expo, but we did manage to explore Austin a little bit. Here is a collection of things that we did, and also things we noticed about the city. It might help you get an idea of what to do if you’re heading to Austin. NB: We feel obliged to mention the heat… If you’re not from a city (or country) that is consistently 30-40+ degrees Celsius, then you ARE going to find it hot. There’s no fighting it, you just have to accept it and let the sweat flow. On a positive note, the Texans are as equipped to deal with heat as Canadians are with snow; every building has air-conditioning and we found plenty of places around to fill up our water-bottles. That being said, prepare yourself…dress light, don’t exert yourself and drink plenty of water. If you are a fan of Rooster Teeth, we highly recommend visiting one of their expos at some point. Unlike other expos where you often just spend time walking around looking at stalls, RTX has a huge schedule of many different panels and shows, as well as a selection of stalls, signing events, community events, meet and greets and more. You can pick and choose what panels and events you attend according to your interests and timing. We attended all 3 days, and found plenty of things to fill up each day comfortably. Panels covered a wide range of topics such as video games, animation, cosplaying, anime, writing, video editing, vlogging, comedy and plenty more. They also had guests such as Mega 64, Houston Outlaws and Meg Turney. We found the event to be really well organised, it seemed to run smoothly and getting into the expo was fast and easy with little to no lines. To make everything fair for all attendees, they only allowed line-ups to begin 1 hour before a panel, and when lines were formed they were organised and orderly. We found we were able to gets into in all of the events we were interested in, except for some of the super popular ones (e.g. Achievement Hunter, RTPodcast). From March to November, Congress Bridge in downtown Austin is home to about 1.5 million Mexican free-tail bats. Not long after the sun sinks behind the horizon, the bats begin to emerge in a stunning synchronization and fly off into the night for their nocturnal feeding habits. People line the bridge around sunset and wait so they can watch this phenomenon. We did this on one of our first nights, and ended up returning twice more because we found it so wonderful to watch. It is a truly amazing experience to be on the bridge and see a cloud of bats flying into the twilight, and it is staggering to see just how many bats live under the bridge (this event can last over 45 minutes). They can fly quite close to the side of the bridge, so if that makes you a little nervous, stand back a bit to feel more at ease. 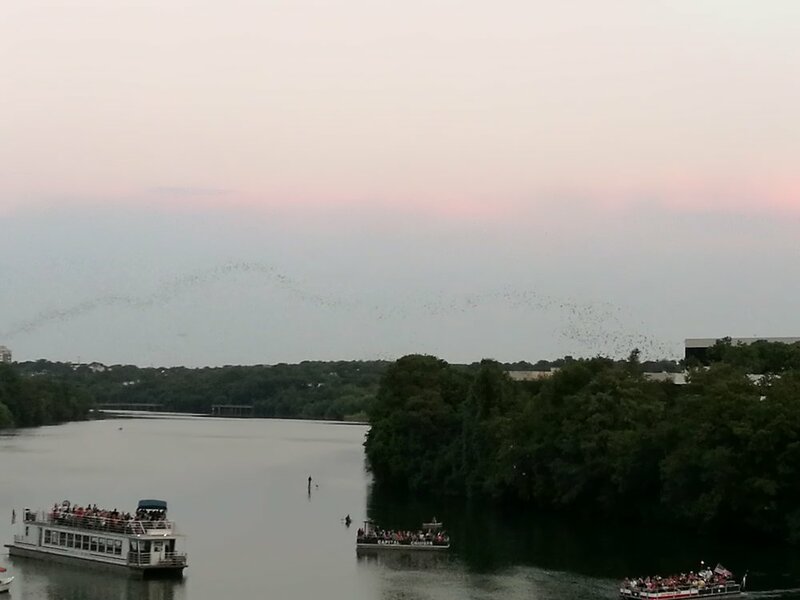 On the other hand, if you want to get up close, there are a selection of boat and kayak tours that will take you onto the water of Lady Bird Lake so you can watch the bats emerge from a different perspective. 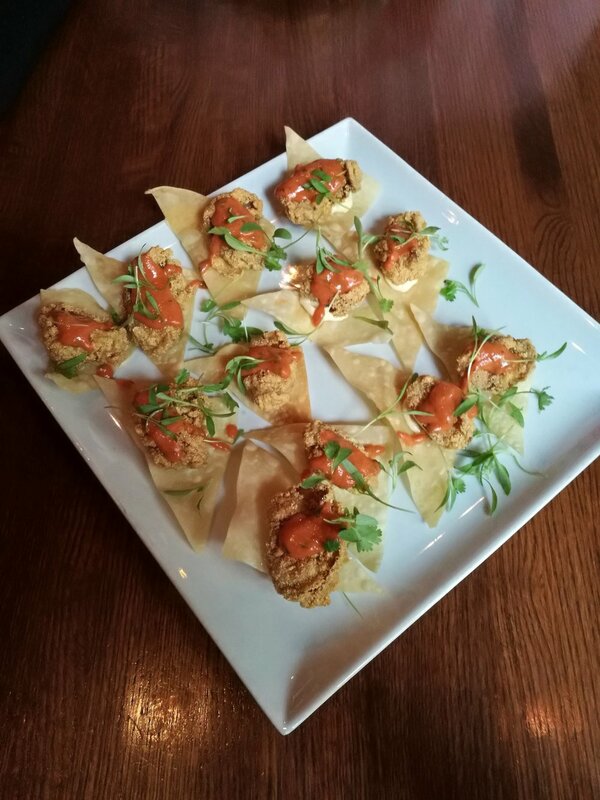 There is A LOT of delicious food to choose from in Austin. TIP: It’s best to visit hungry! Firstly, let’s address the BBQ… Texas is famous for it’s BBQ (particularly beef), and if you are a meat-eater you should definitely try it. It can be a little intimidating to walk into a BBQ restaurant and try to read their ‘Menu’, which usually consists of different types and cuts of meat and the weight in Ounces and Pounds, but the people of Austin are really nice, and will help you if you seem a little confused. It is a little heavy on the digestive system, so keep that in mind when ordering; don’t go if you want a ‘light meal’, share with someone else or with a group to taste more but eat less, and don’t be afraid to take some away in a ‘doggy bag’ if you can’t finish it. Don’t necessarily skip the sides either (corn, potato salad, mac and cheese etc. ), they will help to counter-balance out the mass of meat you’re about to ingest, and they are also really good! Texas is also the birth place of Tex-Mex (Texas-Mexican food), but the main food item you should try in Austin is breakfast tacos. They can be found in a few places around the city, and there are plenty of varieties and flavours to choose from. Much like BBQ, they are not something you’d want to be eating every day, but still a delicious thing to try when visiting the city. 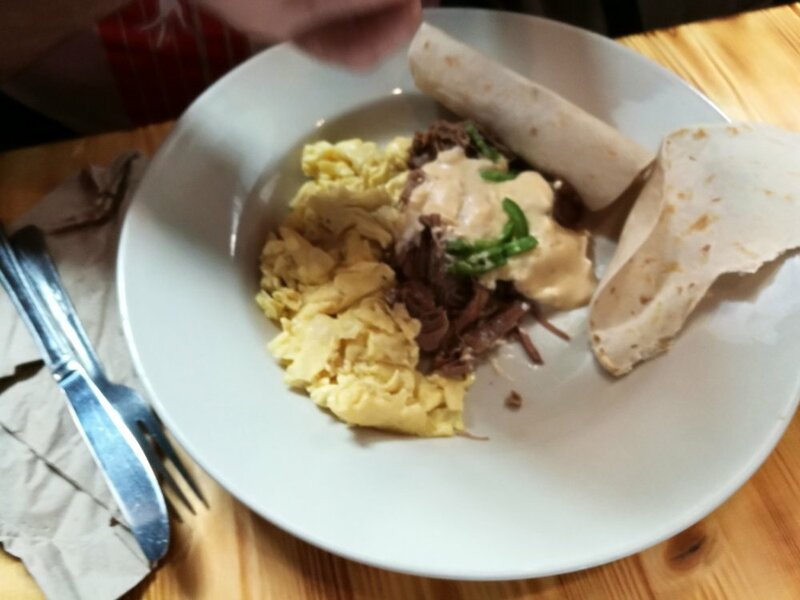 Look out for the Migas taco, which is an Austin specialty with scrambled eggs, tortilla chips and toppings. 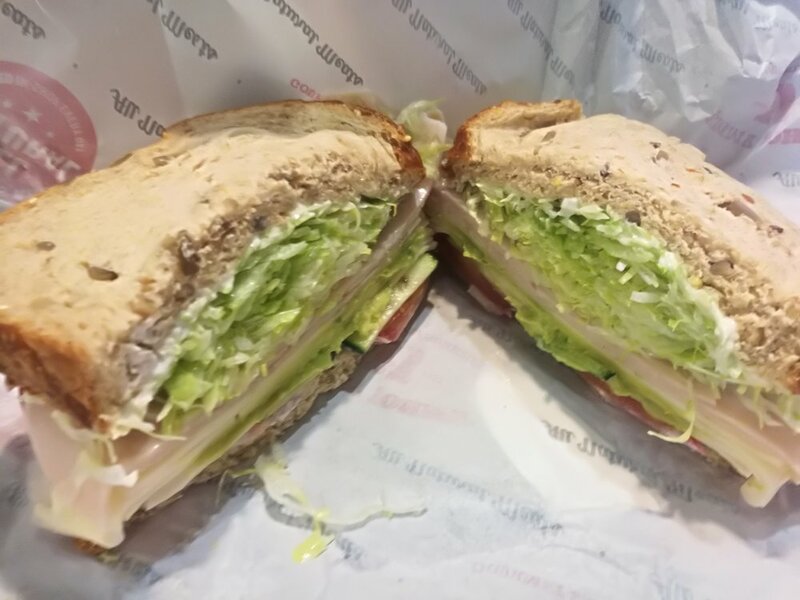 Other great food options to look out for are sandwiches (get as a meal with the potato chips! ), fried chicken, hot dogs, burgers and pizzas…basically all the American foods you know and love. The potato chips in Austin all seemed to have 2 things in common: they were cooked in peanut oil + they were delicious! Austin has a legendary bar scene, in particular the infamous area of 6th street, which is located in Downtown. The street is dotted with many bars, clubs and restaurants and closes to traffic in the evenings and weekends. Don’t just stay around 6th street though, as there are plenty more worthy places not far from it (often less crowded, more classy ones). We went to CU29 for some delicious, elegant cocktails and the bartender there gave us a great run down of the bar scene and some ideas of where to go. Another place worth a mention is Red Headed Stepchild Bar, AKA Floppy Disc Repair company - a speakeasy style bar that requires a secret code to enter. With everything else going on in Austin, we were expecting much more of a specialty coffee scene there. However, we didn’t find a lot of good coffee spots, particularly in the Downtown area where we mostly spent our time. We ended up going to Houndstooth Coffee most days, the only good coffee shop we could find near Austin Convention Centre. They had different beans to choose from for Espresso or Drip coffee, and the drinks tasted pretty good - not too sour or bitter, with a little sweetness. They also had a small range of light breakfast/snack options to choose from e.g. banana bread, breakfast tacos, nut bars, cereal. On our last day we ventured a few blocks out to a place called Better Half Coffee & Cocktails - we don’t remember how we found the actual taste of the coffee, but we do remember finding the drinks a little lukewarm. They had a good food menu though, and quite a large space with seating options inside and outside. An interesting observation we made while in Austin, is that the city seems to have more small, independent Cinemas than large multiplex chains. They are serious about their boutique cinema scene, some even having strict ‘No Disturbance’ policies, where you will be asked to leave for talking or using your phone. Independent cinemas often mean smaller, stylish theaters and a unique range of films to choose from and support. They often also have a menu of great food and drink options to enjoy while watching a movie. We managed to fit in a visit to the Violet Crown (pictured above) to see Eight Grade and we really enjoyed both the movie and the experience of the cinema itself. We would love to explore more of the cinema scene in Austin next time. This is a cool and fun-looking option for getting around the city. You just need to download an App onto your phone and scan the QR code of the scooter, and you’re away. They are electric, so don’t require too much effort, and they look super fun! You do, however, need to be able to use Mobile data for the App (so we couldn’t try it). Just be careful and mindful of pedestrians and cars - the rules for riding these scooters are the same as riding bikes. There are plenty of events that happen each year in Austin (e.g. Austin City Limits, South by Southwest) and it can get very busy when they are on, so just bear this in mind when planning to travel to the city. It might give you a reason to visit Austin, or it might give you a reason to move your trip dates slightly to avoid the crowds. We really enjoyed our time in Austin and at RTX, but definitely feel like we only touched upon the surface of this effortlessly cool and unique city. We would absolutely return to explore it more (and just brace ourselves for the heat)!